Our worldwide bathymetry data represents one of the most detailed models of the global seafloor yet assembled - a unique combination of the latest satellite-derived gravity measurements with digital bathymetric charts based on more than a hundred years of ship-borne hydrographic surveys. We've used each data source where it performs best - satellite gravity measurements in the open ocean, and traditional depth soundings in coastal waters and historically well-mapped areas such as the approaches to major ports. 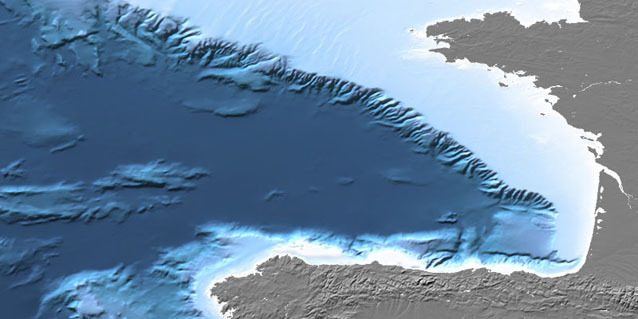 We can also offer high-resolution bathymetry for some areas, such as United States coastal waters and sites of scientific research such as the mid-ocean ridges. (including data reproduced from the GEBCO Digital Atlas published by the British Oceanographic Data Centre on behalf of the Intergovernmental Oceanographic Commission of UNESCO and the International Hydrographic Organisation). We are also able to supply texture maps based on this new bathymetry data.